This villa is super conveniently located, just a few minutes from town and the beach. I love the villa’s simple and open set-up, and the pool is simply beautiful. Comfort, convenience and serenity with breathtaking views! 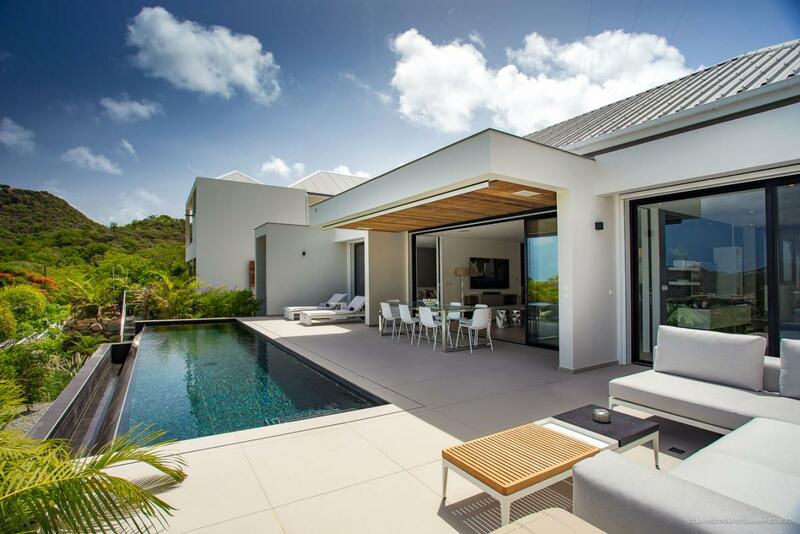 Villa Indyana is a newly built villa that overlooks breathtaking hills. The luxury rental home is well suited for small families who want to vacation simply and comfortably. The infinity edge pool looks out over the lush jungle and is surrounded by couches and sun beds, with several sitting areas and al fresco dining. The outdoor dining area seats 8 and looks directly out to the pool. Villa Indyana is centered around the great room, which merges the living area with the outdoor dining area. The kitchen lies on the opposite end of the great room from the al fresco dining area, with a breakfast bar in between the oven and living area. The kitchen is well equipped, and features a skylight as well as a picture window. Both bedrooms sit on opposite sides of the living area, with king beds and terrace access. Both bedrooms also have large ensuite bathrooms. One bedroom has a separate dressing area, while the other has double vanities and a skylight. Indyana Villa is an understated chic villa with comforts that will make your vacation a memorable one. Hermès toiletries and Welcome gifts are complimentary at your arrival as well as free Wi-Fi. We provide free luggage storage until your next stay.